Alhamdulillah, our article has been published in its final format. You can download the PDF for free until June 17, 2017. S. Wibirama, H.A. 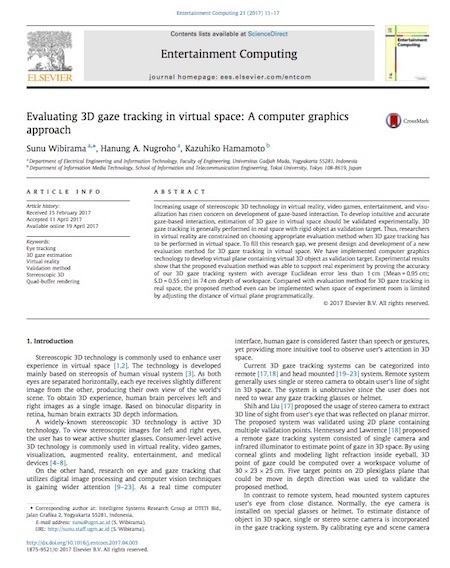 Nugroho, K. Hamamoto, “Evaluating 3D Gaze Tracking in Virtual Space: A Computer Graphics Approach,” Entertainment Computing, Vol 21, June 2017, pp.11-17. • A novel method to evaluate 3D gaze tracking with computer graphics technology. • The proposed method can be implemented in minimum room space. • The method can be used in virtual space regardless of how depth cues are presented. Increasing usage of stereoscopic 3D technology in virtual reality, video games, entertainment, and visualization has risen concern on development of gaze-based interaction. To develop intuitive and accurate gaze-based interaction, estimation of 3D gaze in virtual space should be validated experimentally. 3D gaze tracking is generally performed in real space with rigid object as validation target. Thus, researchers in virtual reality are constrained on choosing appropriate evaluation method when 3D gaze tracking has to be performed in virtual space. To fill this research gap, we present design and development of a new evaluation method for 3D gaze tracking in virtual space. We have implemented computer graphics technology to develop virtual plane containing virtual 3D object as validation target. Experimental results show that the proposed evaluation method was able to support real experiment by proving the accuracy of our 3D gaze tracking system with average Euclidean error less than 1 cm (Mean = 0.95 cm; S.D = 0.55 cm) in 74 cm depth of workspace. Compared with evaluation method for 3D gaze tracking in real space, the proposed method even can be implemented when space of experiment room is limited by adjusting the distance of virtual plane programmatically.